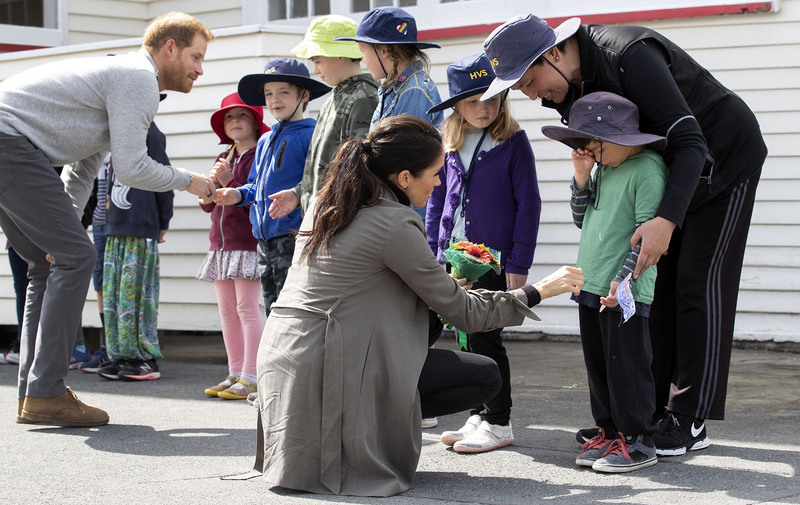 Meghan Markle has been demonstrating her generous side while on the royal tour in New Zealand. The Duchess of Sussex, who recently revealed through Kensington Palace that she is expecting her first child, visited the famous Maranui café earlier this week with husband Prince Harry. Of course, throughout their trip the parents-to-be have been busy with their jam-packed schedule and have been in high demand from royal fans across the continent. The expectant parents, who were eager to start a family as soon as they could, have even been divulging baby details to fans that have come out to see them, including what they’ve planned for their first family holiday, the royal baby’s gender and even baby names! But it’s not only the grown-ups who have an interest in the royal couple. Outside the local café, a group of young children were sitting in wait for a glimpse of the English prince and his new bride and it seems like they got more treats than they bargained for. Not only did the Duke and Duchess take time out to talk to the young royal fans, Meghan came bearing gifts. On seeing the children in wait, the mum-to-be, who recently confessed her due date, returned to the café and asked if all the platters of cakes and sweet treats that had been presented to the royal couple but had not been touched could be given to the children. After the café agreed, the children, who were visiting from Houghton Valley School, were given cakes while they talked with Prince Harry and Meghan. ‘They asked us what our names were and also they were really nice and just talked normally to us,’ one child told local TV network TV NZ. Sounds like one hell of a school trip!